Oh no! Did you get to set up your schedule for the next semester only to look in horror as the only available options for classes were at night?! 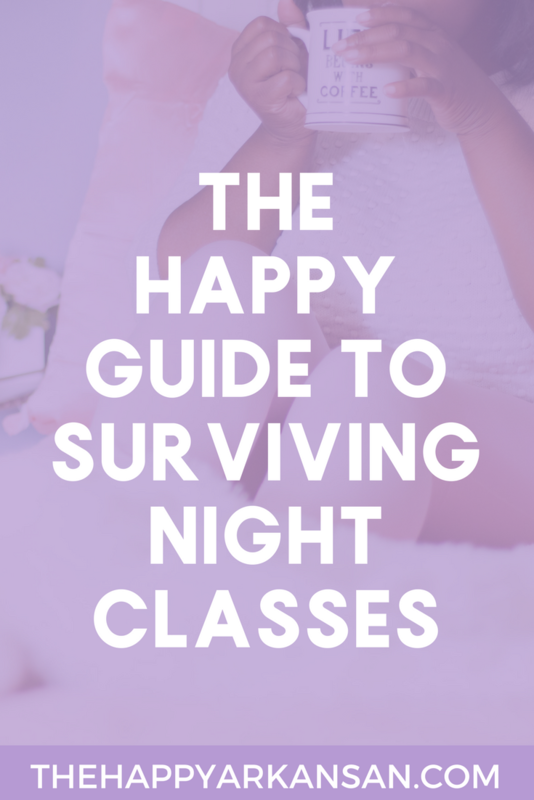 Night classes can be a pain, if you let them, today I am going to share my tips and tricks for making night classes more tolerable and less frustrating. Before I came to graduate school I believe I had at most two night courses through my entire undergraduate career. Once I got to graduate school I didn’t really have a choice, most graduate programs have flexible classes these days. A big fraction of people don’t go straight into graduate programs now. They work a little bit, have families, and then go back to the grind of attending college. This means that a lot of classes have to be able to meet their demands of later courses and sometimes that means night classes that only meet once a week. The one thing that makes me most excited about night classes is remembering that I only have class once a week. While some people get a small class three days a week, I get to get mine over and done with. That leaves an entire week for me to focus on everything and anything else. I can take time to get my homework done, binge-watch Jane The Virgin, or work on my blog posts. I only have to psych myself up for class once. I don’t feel the need to skip as often because I tell myself, “It’s only one class! Why skip this time?” I definitely love that part of having night classes because it is so easy to convince myself that I need to go to the courses I am in. Should you feel the need to skip though, remember, this is an entire weeks worth of class. You need to think about what you are doing even more so when you skip a night class because it’s like missing a week of class. You can’t use the same “It’s only one class!” argument on a night class. It just won’t work, and will get you way more behind than you want. Get up and get to class. Night classes can be extremely hard to get to when it gets dark, so my suggestion is place your night class on a day when you have other involvements. For example, my Tuesdays are super long, I get to campus around 10 AM and don’t leave until I am done with my 5:30-8:20 PM night class. For me, I know it would be hard for me to leave for campus in the afternoon so I always try to go in the morning (I also have two other classes on Tuesday so that helps.) Last semester when I had night classes I always tried to get to campus around 12 PM or a few hours before classes started. I found that when I got there earlier, I was less likely to want to skip. When I waited until later in the day I was more likely to want to skip class that day. Night classes will drag on and on. They are usually around 3 hours long, sometimes with a small break in the middle (and sometimes the professors forget what the word break means.) It’s important to understand that when you are in for a late night. If I can, I usually try not to skimp on sleep the night before. So I try to at least get 6 hours of sleep. The more well-rested you are for the day, the better you feel about tackling your day. For me, my Tuesdays are pretty long. I am up from 9 AM to 9 PM getting ready, going to work, or going to class. Twelve hours straight of that is draining so sleep and energy is important. Make sure that on your days when you do have a night class that you don’t have anything that zaps your energy too much. You want to make sure that you can disperse the energy you use throughout the day so that you don’t use too much in the morning and have very little in the afternoon. If I am feeling a little zapped for energy sometimes I drink coffee or a smoothie from the coffee place where I go to class, but that might have different effects on different people. Also, don’t get too accustomed to constantly getting coffee to keep you awake, only use it when you really need it, because eventually your body could become immune to it’s effects. Overall, though, you shouldn’t be using coffee as your main source of energy. Sleep and balanced food should be your main source. Night classes are usually also right around dinner time. Most night classes are around 6-9 PM; so that means that you are more than likely missing dinner. Make sure you eat before class if you can, and if you can’t make sure you bring a few snacks or change for the vending machines during your break. Bring snacks that won’t make you groggy or tired, and leave the distracting snacks at home or pack them in a different way. So maybe pack your chips in a ziplock bag instead of the regular chip bag. Know yourself and what food does to your body. Don’t overeat before your night class because that can be as counter-productive as not eating at all. Avoid foods that might make your stomach upset or give you heartburn. You want the foods that you eat to be filling but you also want to make sure that they don’t cause your body to have other stresses. One of my favorite things to snack on is a homemade trail mix. It’s so easy to make a trail mix, and you can pack it full of so many yummy ingredients. If you are unsure of how to make a trail mix, this awesome blog will show you exactly how to create a yummy trail mix. Class is going to go slow if you are constantly looking at the clock on the wall or worried about when it’s time to leave. My best advice is to actually get involved with the class and class discussion. Time will pass much faster if you aren’t focused on it (time is strange like that). So instead of worrying about all the hours of class that may or may not have passed; get involved with class. Answer some questions, engage in a discussion, listen to your professor, take class notes. At the end of the day that will make your time in class so much easier to handle. I am always trying to get involved and stay involved with my night classes. I am lucky that my night classes now are graduate level and they let me get super involved in the lecture and how things work, but that’s not always the case. Just remember there are other ways to participate and just try to stay in the moment as much as possible. Don’t dwell on this something, but give yourself a reward for finishing your night classes. Last semester I would watch The Mindy Project every Tuesday after I got done with my night class; this semester I usually go home, work on my blog, and watch The Nightly Show With Larry Wilmore. Giving yourself something simple to look forward to as a treat for getting through the day can be so important. It doesn’t have to be anything big, but it could be. Sometimes I go out to eat, or do a little online shopping as a reward. It really depends on what is in your budget and what you can handle. What are your tips for surviving your night class? I enjoyed my night classes for the same reasons. I had two jobs when I was in college and only having to sacrifice one block of time instead of three definitely worked in my favor. Great advice! Yes! Just getting myself psyched up once a week is so much easier on my schedule than doing it multiple times. Next semester I might have to do a two day a week class and I am not sure how my body will handle that. Last year, I had 2-3 night classes because I was working part-time and doing an internship. Bringing a lot of snacks is a very good point! I always was hungry after class… even if I ate dinner right before it. Definitely, the after class hunger is real! I usually still eat after class even when I bring snacks, because I usually don’t eat enough throughout the day since my Tuesdays are packed from 11 AM to 8:30 PM.